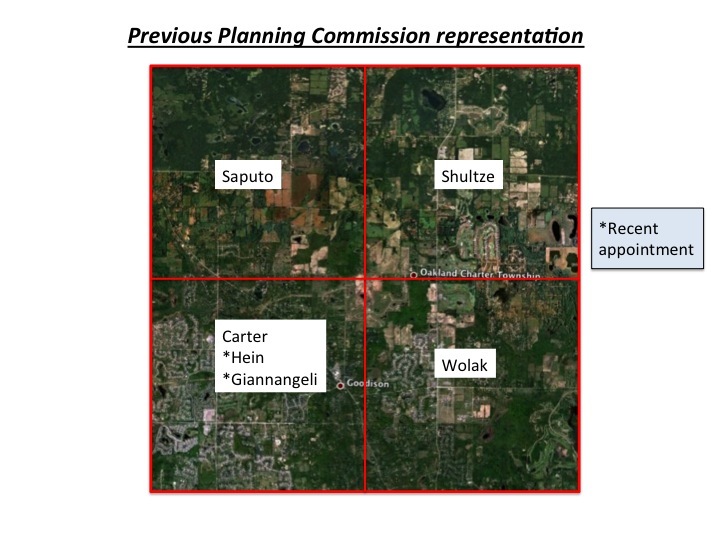 At the beginning of the August 12, 2014 Oakland Township Board meeting, Planning Commission Chair, Jim Carter, made a request of Supervisor Gonser to allow him to comment on the Planning Commission appointments that were going to be discussed later on the agenda. Typically these comments would be heard when the agenda item came up. Jim asked if he could provide his input during the ‘Citizen Comments’ portion of the agenda, since his father-in-law was in the hospital’s intensive care unit with ‘his chest open’. He clearly wanted to get to the hospital, but indicated that he would stay if Gonser would not allow him to speak at that time. Amazingly, Supervisor Gonser wanted Jim to stick around and make his comments later in the meeting. Fortunately, Treasurer Langlois and Trustee Buxar intervened and asked Gonser to allow Jim to speak so he could leave. Gonser then reconsidered and allowed Jim to make his comments. Later in the meeting, Gonser made negative comments about how the Planning Commission has treated citizens. He stated that “citizens were treated very disrespectfully”. Does Gonser’s treatment of Jim Carter seem “respectful” to you? Why is this important to the citizens of Oakland Township? This incident is yet another example of our Supervisor’s lack of sensitivity and his desire to have things ‘his way’. How would you have responded to Jim Carter’s request? I think very few people would have made the decision Gonser made. Gonser’s decision provides some insight into his true character. Also, his comments regarding citizen treatment at the Planning Commission are not founded in fact. Any person who has participated or watched the Planning Commission meetings knows that Jim Carter is the epitome of professionalism – A characteristic that is absent in several of our Board members, most notably Supervisor Gonser. This entry was posted in Supervisor Gonser and tagged Dictatorship, Jeanne Langlois, Supervisor Gonser, Supervisor Terry Gonser, Terry Gonser, Unprofessional behavior on August 20, 2014 by richardjmichalski. This entry was posted in Planning and Zoning, Supervisor Gonser and tagged Abuse of Power, Gonser, Planning and Zoning in Oakland Township, Supervisor Gonser, Supervisor Terry Gonser, Terry Gonser, Unprofessional behavior on August 18, 2014 by richardjmichalski. At the August 12, 2014 BOT meeting, the Township Board made a number of appointments that, according to Supervisor Gonser, will have a significant impact on the character of our Township. There were three appointments to the Planning Commission, one appointment to the Zoning Board of Appeals and one appointment to the Tax Board of Review. None of the Planning Commission appointments were unanimously approved. The other two appointments were unanimously approved . At two points during the meeting, Supervisor Gonser stated that per Michigan statutes, the Supervisor “appoints the candidates subject to the Board’s approval”, indicating that only he has the authority to nominate the individuals for the positions. There will be another post on this website sharing the concerns raised by several Board members and citizens over the appointment of the Planning Commission members. Owner of Hein and Kwapis Architects P. C.
There will be an additional post regarding the concerns of several Board members over the appointment of the Planning Commission members. Why is this important to the citizens of Oakland Township? The appointments to the various Boards and Commissions are very important to the citizens because these individuals will be making decisions that will impact the residents of our Township. 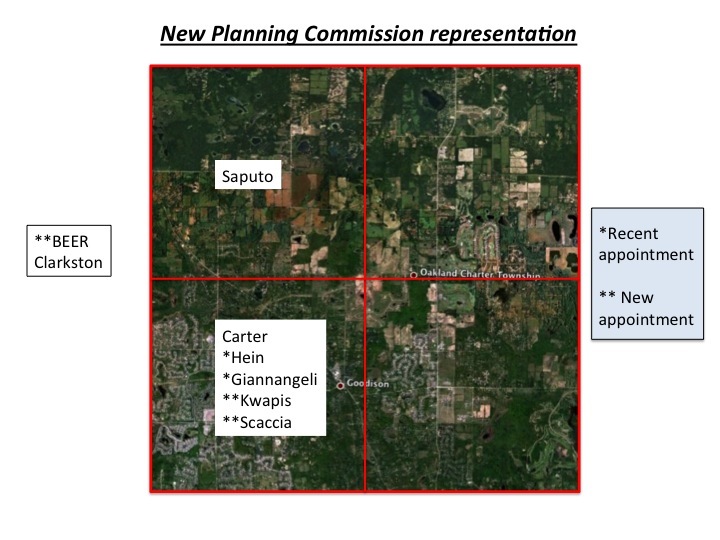 In particular, the Planning Commission appointments are very important since we are currently involved in reviewing and updating our Master Plan. The Planning Commission will now have only two people with any Planning training as the Township undertakes this critical process. This entry was posted in Board of Trustees, Board split?, Planning and Zoning and tagged oakland township, Supervisor Gonser, Supervisor Terry Gonser, Terry Gonser on August 17, 2014 by richardjmichalski.